After more than six months of full time attention and programming, the information technology team for the Office of Vital Records (OVR) upgraded MR&C and released a new version into production early on January 5. The upgrade focused on JavaServer Faces (JSF), a high-level computer framework for building component-based user interfaces for web applications. The MR&C upgrade was necessary so that future programmatic enhancements could be accomplished with greater efficiency and confidence. Staff from Minnesota IT Services (MN.IT) who support MR&C explained the upgrade in plain language: “It’s like MR&C was programmed with Windows 97 and we didn’t make any mini-upgrades as new versions were available; instead, we jumped to Office 2013.” If we didn’t do the upgrade now, the possibility and potential to enhance MR&C with new functionality in the future would have been limited. With the MR&C upgrade, IT staff examined all aspects of the application, assessed, then wrote programming to apply changes. The comprehensive effort included all of MR&C’s separate modules for birth (including fetal death), death, administration, customer service, and the Minnesota Fathers’ Adoption Registry. The programming was extensive and the testing intensive. Overall, the efforts were deemed a large success; however, it didn’t take long before the OVR phone lines began ringing and the email inbox began filling up. “Stakeholders and users of MR&C were extremely helpful in reporting details about the issues they were experiencing,” commented Molly Crawford, the State Registrar. “They provided details, state file numbers, and computer screen images so that our IT staff could quickly understand and fix issues.” MR&C production went down briefly the afternoon of January 6 to put repairs into place which significantly improved operations and users’ experiences. Another mini-release is planned for Thursday, January 12. “We appreciate everyone’s patience as we work through the last few details. You’ve been very helpful partners and allies as we improve our statewide system. By the end of the week, activities with MR&C are expected to be efficient,” said Crawford. With the JSF upgrade, MR&C’s new look was instantly noticeable on the log in page. Visible changes included color and more keyboard friendly functions, improved accessibility and navigation especially with the ‘search’ and ‘selection’ features. Users can tab easily or choose to use their mouse. Some of the data fields work differently, but the field layout in MR&C didn’t change. MR&C users who experience problems, need help, or have challenges with the system in accomplishing their usual work, should inform OVR. Please contact the OVR Helpdesk at: 651-201-5993 or 888-692-2733 or health.MRCAdmin@state.mn.us. Representatives are available Monday through Friday from 8:00 a.m. to 4:30 p.m., except for state holidays. If you leave a message after hours, representatives will contact you the next business day. Parents who experienced a fetal death in 2016 or later may be eligible for a new tax credit when they file income taxes with the Minnesota Department of Revenue, Credit for Parents of Stillborn Children. Because a Certificate of Birth Resulting in Stillbirth is required to claim the credit, the Office of Vital Records (OVR) created a brief training to explain fetal death reporting, the process for getting a certificate, and suggestions to help families. Health professionals involved in birth registration such as hospital birth registrars and others who work in vital records are invited to participate. The 30-minute interactive webinar, Reporting Fetal Deaths with Confidence, will be offered live on January 24 at 2:00 p.m. or January 30 at 9:00 a.m.. Register for the webinar by email to health.MRCAdmin@state.mn.us and type Reporting Fetal Deaths in the subject line. OVR will email you a passcode and link to the webinar. Fewer than 400 fetal deaths are reported each year compared to the nearly 70,000 births per year in Minnesota. Because birth registrars and funeral home staff report fetal deaths infrequently, OVR will post the Reporting Fetal Deaths with Confidence webinar after it is broadcast for future reference. The business of vital records saw much change in last year. We did more—sometimes with fewer people, more people, different people, and new people. We set goals and worked SMARTer—SPECIFIC, MEASUREABLE, ATTAINABLE, RELEVENT, TIME BOUND. We made MR&C bigger and better. We traveled back in time (OVR staff have entered birth records into MR&C now all the way back to 1933), and, we looked to the future. Governor’s Continuous Improvement Award for improving the availability of preliminary death data for public health purposes and timeliness for complete death certificates. The Centers for Disease Control, National Center for Health Statistics recognized Minnesota for outstanding performance on our Vital Statistics Cooperative Program—our contract to collect vital records data and share de-identified data for public health purposes. Minnesota IT Services nomination for exemplary programs and technical relationships—OVR program and our dedicated IT team for MR&C. Formed a new OVR Help Desk and hired new staff to centralize stakeholder support and provide more responsive, complete, and uniform customer service delivery. On birth and death records we added an optional data field to collect last names before first marriage for all parents. On death records we started collecting data from medical examiners on the number of religious objections to autopsies (45 death records marked this as 'YES') and from funeral staff, the number of decedents that are embalmed regardless of the type of disposition. The 5R’s of Death Registration—73 morticians received 3 hours of continuing education credit and many of their staff attended to increase their professional development. Exhibits at 12 events—building awareness of the important work of vital records with thousands of participants. We added a new holographic foil stamp in the State seal on the Minnesota certificate. Now we have 12 built-in security and fraud prevention features which makes our certificate among the most secure in the U.S. (October). Replacing 7,960 original birth records: 4,048 for paternity with the Recognition of Parentage, 1, 473 for adoption, 263 for various court-ordered reasons, 2,176 for adjudications. Amendments to birth records—down from five weeks to less than three. Replacement records for adoptions—down from more than five weeks to just over two. Replacement records for court-ordered adjudications (adding second parents to birth records)—down from 11 days to two or three. 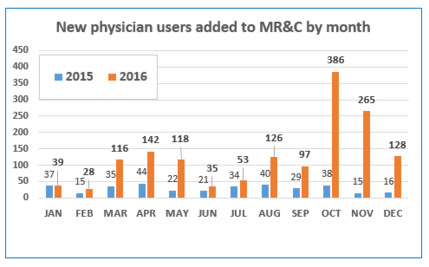 Promoting and supporting change in policy for electronic authorization for final disposition and maximizing use of MR&C for death registration. Allina Clinics requiring physicians to use MR&C for death registration and implementing processes for coverage and backup such as designating staff to enter cause of death information on behalf of physicians. Partnering with OVR to train health professionals at more than 70 clinics. 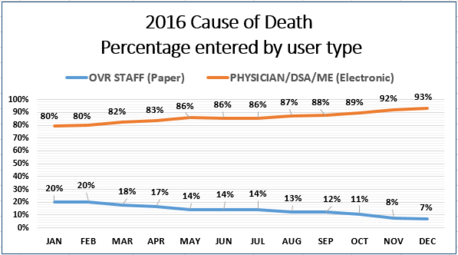 Increasing use of the MR&C system for registering the cause of death—from 78% of death records to more than 93%. Happy New Year from the Office of Vital Records! When registering vital events, signing documents, and notarizing paperwork, check to make sure you are using 2017. Avoid re-work and rejected requests by reviewing your work and quality checking. Registering vital events with wrong date of birth or death requires that the record be deleted and new record created. Notarizing documents with the wrong year makes them invalid. Remember to review, revise, and avoid re-work. January 16, 2017, Martin Luther King Day - state offices are closed. January 17, 2017, 8:15-9:45 a.m., OVR all staff meeting. Responses to voice and email messages will be made after 9:45 a.m.
January 18, 2017, 8:10 a.m., "Ask the Undertaker" talk show on KWNO radio Winona at 1230 on the AM dial. January 24 & 30, 2017 - Reporting Fetal Deaths with Confidence Webinar. Email health.MRCAdmin@state.mn.us to obtain the webinar link and passcode. February 6, 2017, 3 - 6 p.m., Safe and Secure: Training for Vital Records Officers at DoubleTree by Hilton Bloomington. February 6, 2017, Minnesota Father's and Families Summit, St. Cloud. MN Fathers' Adoption Registry presentation. February 7 - 9, 2017, Minnesota Association of County Officers (MACO) Annual Conference at DoubleTree by Hilton Bloomington. March 9, 2017 - Birth Registration 101 for new birth registrars, noon - 4 p.m. The class is at the Minnesota Department of Health Freeman Bldg., 625 Robert St N, St. Paul, MN 55155-2538.